Noni herbal fruit is available in India in the form of concentrated juice. Noni juice is made from the pure extracts of the fruits of a medicinal plant, Morinda Citrifolia, without any chemical residues, toxins, pesticides, heavy metals or fertilisers. Noni is processed with high care to maintain its bioactivity and keep its active components intact. 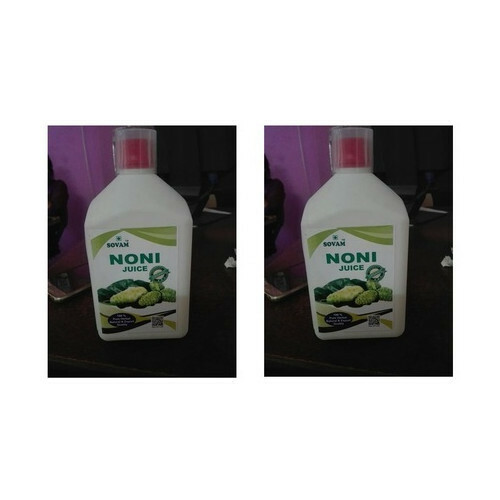 Noni is rich in Vitamins A, C, E, B, B2, B6, B12, Calcium, Iron, Niacin, Folic Acid, Pantothenic Acid, Phosphorus, Magnesium, Zinc, Copper and other minerals like Chromium, Manganese, Molybdenum, Sodium, Potassium, Carbohydrates. It is herbal and hence totally, a gift of Nature. Noni contains several health enhancing attributes that are antibacterial, anti-inflammatory, anti-oxidant, adaptagen, analgesic, anti-congestive, hypotensive, and has cancer-inhibiting compounds. It enhances cellular activity, the starting point of all nutritional metabolisms. Noni might exert a preventative and protective action against cancer during the initiation stage, which is the first phase of the formation of the cancer. Many feel antioxidant activity is an important function of Noni juice and one of the reasons so many people have reported success with cancer while using the juice. There are more than 300 alternative therapies for cancer and Noni is supposed to stand among the top ten. Herbal Noni Juice known as Marinda Citrifolia has been used for more than 2000 years to support the entire body function. It is very beneficial in symptoms like poor digestion, high blood pressure, diabeties, respiratory problems, immune related symptoms and arthritis pain. It boosts body's energy, that's why Noni is known as miracle fruit with amazing health benefits. Noni juice, Garcinia, grapes extract. No added Sugar, Color, Vitamins and Minerals. Doses Drink on an empty stomach at least 30 minutes before meals, diluted in 150 ml of water. First 3 days - 5 ml daily. Second 3 days - 10 ml twice daily. Seventh day onwards you can take 10 - 15 ml twice daily. Use twice daily for about 6 to 12 months for better results. Drink plenty of clean water through the day. Due to natural products slight change in color & taste changes and sedimentation may occur. Use within 1 month of opening the lid and put in refrigerator. Organic Sovam Natural Noni known as Marinda Citrifolia has been used for more than 2000 years to support the entire body function. It is very beneficial in symptoms like poor digestion, high blood pressure, diabeties, respiratory problems, immune related symptoms and arthritis pain. It boosts body's energy, that's why Noni is known as miracle fruit with amazing health benefits. Doses: Drink on an empty stomach at least 30 minutes before meals, diluted in 150 ml of water. First 3 days - 5 ml daily. We have only used sun-sensitive glass containers for preservation of the Silver content. Neem Karela Jamun Juiceis our Unique research herbal product Boon For Diabetic Patients. Leveraging on our years of experience and in-depth knowledge of this domain, we are offering a comprehensive range of quality-assured Neem Karela Jamun Juice to our prestigious clients. These powders are processed using dry neem, karela and jamun by our skilled professionals. Furthermore, these are highly acclaimed among clients for their purity and long shelf life. The offered range is tested by our quality controllers against various parameters of quality.